When we announced that we were going to build a playground in the Gulf shortly after Hurricane Katrina, not everyone was happy about it. With so much devastation, some believed that a playground was the last thing people needed. Why invest time, money, and sweat into something so “superfluous” when residents were still struggling to get basic necessities, like shelter, food, and water? Some may ask the same question of Julie Rearick, a representative from the playground equipment manufacturer Playworld Systems (a KaBOOM! partner). 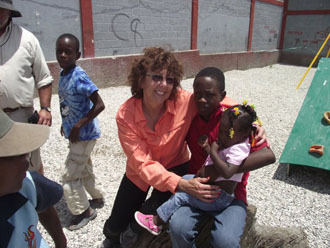 She recently traveled to Haiti with a group from Lifechurch in Allentown, Pa., a Playful City USA, to help build a playground at a tent city in Carrefour. Currently, there are more than 800,000 homeless people living in tents in Port au Prince and Carrefour. Learn more about building playgrounds in disaster zones in the Huffington Post.